Dave and I both LOVE to cook, but if I’m honest, there are very few cookbooks I pick up that garner an immediate, enthusiastic response from me. Often they incorporate ingredients which are simply out of the realm of my standard grocery list – which isn’t a deal-breaker, it just means an extra trip to the store to prepare a single recipe. Ain’t nobody got time for that. The Rugby Pantry by Daisy Dagg and Amber Vito is firmly rooted in the collective NZ kitchen, and that is why I love this recipe book. I could have picked any of a number of dishes to test as the majority include ingredients that are amongst our family staples. Bravo ladies, this is exactly what I need as inspiration for family dinner on a Wednesday night when time is short and so is my culinary creative genius lol. The mythical All Blacks (whom are positively adored by every member of our household!) seem to, in general, have wives and partners that shy away from the limelight. I think that’s part of my initial attraction to The Rugby Pantry; catching a wee glimpse of two obviously fab women who love and support two of our national heroes, is perfection in print. It helps that Daisy and Amber’s passion for food shines through on every page. Each recipe is accompanied by luscious images of REAL food, often inspired by, and apparently always enjoyed by their husbands, Israel Dagg and Victor Vito. 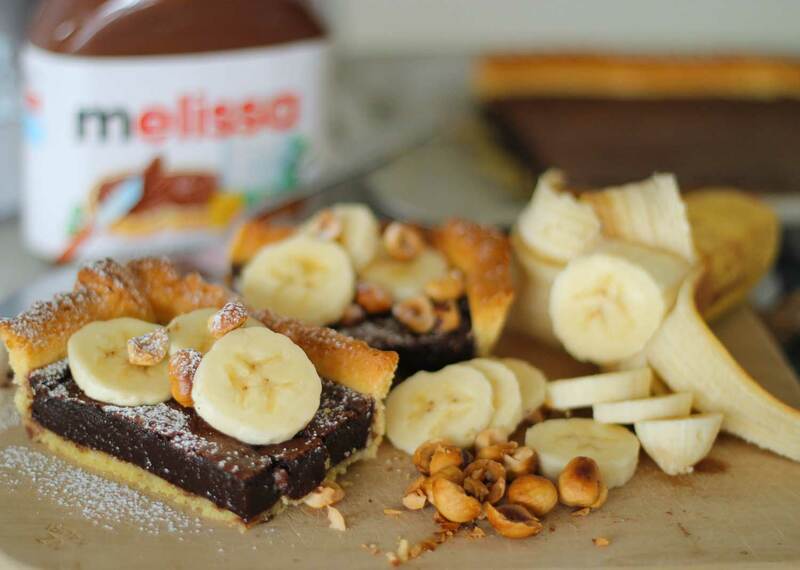 The recipes comprise a perfect balance of well balanced meals, snacks and sometimes-treats – which is of course what I gravitated towards when deciding to try Amber Vito’s Dark Chocolate Nutella Tart. It did help that I had a huge personalized jar of Nutella delivered last week but hey-ho! Result? Simple, delicious and sophisticated. Because I’m quite sure anything ‘tart’ is sophisticated right? I actually don’t own a tart pan as I’m half westie, so I made do with a slice pan and used some cookie cutters to crimp the pastry edges. Worked like a charm. I followed one of the serving suggestions and we devoured this deliciousness with sliced bananas, roasted hazelnuts and a light dusting of icing sugar. There are so many other recipes I’ve got lined up, ready to inject some variety into the midweek dinner and lunchbox grind. This week I’m adding Izzy’s Pre-Game Teriyaki Chicken on Rice to our menu, Crispy Prawn Tacos plus a batch of Carrot Cupcakes with Cream Cheese Icing for the lunch boxes. 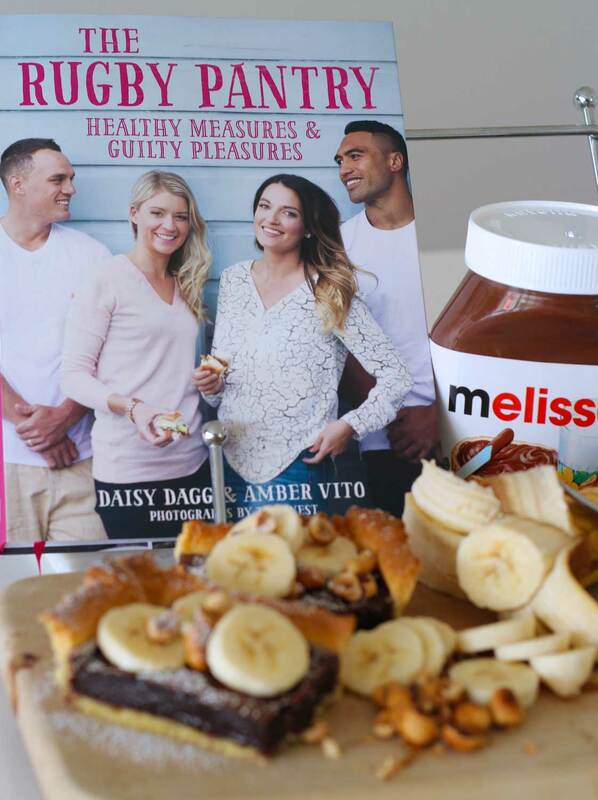 The Rugby Pantry: Healthy Measures & Guilty Pleasures is definitely a recipe book for the modern New Zealand family. The distinct lack of pretentiousness sees the girls include welcomed shortcuts – such as the store-bought short-crust pastry I used in the Nutella Tart. This beautiful book is available now, RRP $44.99, plus, I have one copy to give away! To enter just head over to The Best Nest on FB and follow the instructions on the competition image (closes Thurs 17/9 @ 10pm).